The folks at Weider Pet Health delighted me recently by sending an email suggesting an article about dog fitness...and how owners can stay fit along with their dogs. "If you and your beloved canine are leading a sedentary lifestyle, it might be time for a change that can benefit you both," they wrote in the email. "Regular exercise helps humans and canines maintain muscle mass and improve cardiovascular function, both keys to health, wellness, functionality and longevity." Before you follow any of these, keep in mind that dogs, like people, can't go from zero to full-throttle. If your dog has been a stay-at-home pooch, has health issues, is old, or has any health conditions, call your vet and ask about the best routine. A human-canine fitness partnership should start as early as possible in your dog’s life. “Use it or lose it” applies to dogs, just as it does to people; physical exercise preserves muscle mass. But it’s never too late: even if exercise isn’t a regular part of your (and your pet’s) routine, it can be added immediately. A brisk 20-minute walk daily will have an impact. Games can be fun for you both, especially if you vary your body position to include squats and lunges and play games such as tug of war. In tug of war, be careful of the dog’s teeth and gums, and never pull too hard. Also don't ever pull in a way that strains the dog's neck, especially in smaller breeds. There are other games too that keep you moving, changing positions, and allow for stretches and gentle twists: a game of catch with your dog is an example, or a game of fetch on a slight incline. 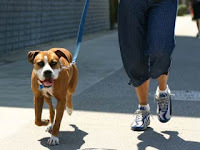 If your dog is older, out-of-shape or has hip weakness be sure the incline is not very steep. Remember that just as with your pet’s diet; you are in charge. For both of you to be active, you must be the proactive one. You set the pace to challenge your animal to a certain extent, but must also know its limits and play within that. Note that some breeds will keep on playing to please, even if they are exhausted. Always finish the workout with a special but healthy food treat. It's important to remember, according to the experts at Weider, that exercise is only part of the equation. Nutrition is as important to dogs as it is to people. For dogs, they say that "Complete live nutrition is important from an early age as a preventive measure. Processed dog foods may or may not contain key nutrients for joint health -- for example, chondroitin and glucosamine. Even when these are listed as ingredients, their potency is lost in processing, meaning they are not bioavailable to the pet."